Largs is a lively seaside resort located on the Firth of Clyde. It is a very popular place for holidaymakers and a regular port of call for sailors, as it has the largest and most well-equipped marina in the whole of Scotland. Those looking for a much briefer boat trip can take a ferry across to the nearby Isle of Cumbrae and during the summer months, climb aboard the Waverley Paddle Steamer. Unlike most towns in Scotland, the most famous battle in Largs’s history didn’t take place against the English, but against the Vikings, who unsuccessfully tried to land on Largs in 1263 but were driven away by the defiant locals. The resort’s Viking heritage is celebrated at ‘Vikingar!’, a fun filled interactive visitor attraction, and it also has an annual Viking Festival. Another vibrant and rather unique attraction Largs has to offer is the nearby Kelburn Castle and Country Centre. The castle has been restored in an extremely unexpected way-its exterior has been completely repainted in various brightly-coloured designs by a team of Brazilian artists. This unorthodox and eye-catching castle brings a steady trail of tourists every year, as does the surrounding woodland in the 3500 acre estate. There is certainly no shortage of great venues to host events in our fun and scenic resort, and the Hog Roast Largs team have always been in the thick of the action every step of the way. 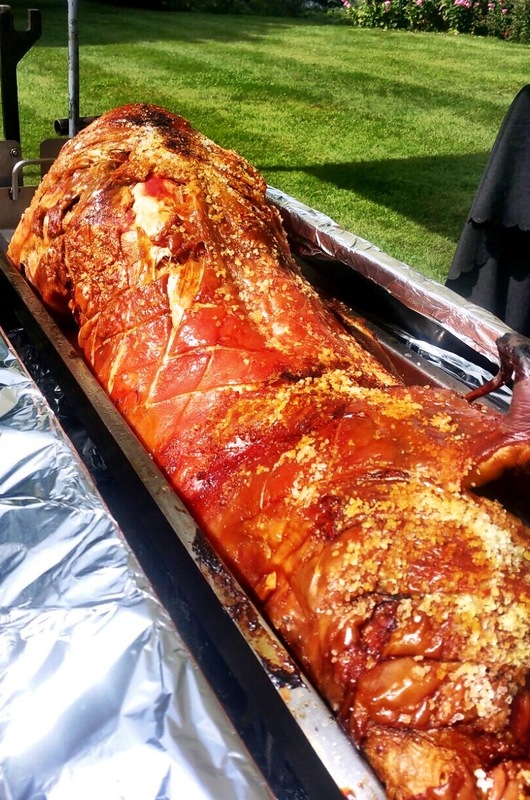 Our hog roast catering services are incredibly popular for all different types of events, not only because we can supply the best pork in the area, but also because nowhere is off-limits to us in terms of location. Whatever your favourite thing to do in Largs is, if you choose Hog Roast Largs to handle the food, you can have your special occasion in your ideal spot and let us worry about all the practicalities. We always plan every event down to the smallest detail to ensure the food is perfect and everything runs like clockwork on the day, so whether you prefer a harbourside or woodland setting, or are in need of a meaty Viking-themed banquet, Hog Roast Largs have the experience and expertise to cook anywhere for any occasion and for any amount of people.